The degree is informed by the normative disciplines of Roman Catholic Theology and is a means to study the Carmelite tradition at a formal academic level and to achieve a proficient level of competence in theology, history and spirituality. who have already completed the CIBI Diploma in Carmelite Studies and wish to continue their academic engagement in the field of Carmelite Studies and to bring their studies to Baccalaureate-level. The course is designed for those who want to continue working while studying, or for someone who may not have easy access to one of the traditional education providers, or who may not have the time to commute to and from lectures daily. We also welcome students who want to study the course full-time, which allows students to complete the course in a much shorter time-frame. The course offers students the opportunity to read and study individual modules at their own pace in a structured yet flexible approach on a part-time or full-time basis. The range of subject areas on offer will provide the background for candidates to engage critically in the ongoing dialogue between the Carmelite tradition and the contemporary world. Students who successfully complete this course will be able to describe, present and critically engage with the principal elements of the Carmelite tradition. The degree is structured to enable students to study the essentials of a theological approach to the Christian life and become familiar with the history and traditions of Carmel, its Saints and Blesseds, and their approach to prayer and Christian living. Semester 2: January – April. The course is delivered in the form of a phased release of reading material made available through the CIBI website. Each taught module is assessed by four ten-question questionnaires and an essay. Four long essays of between 6,000-7,500 words are required for the course. The four long essays are based on the 5 obligatory modules in each of the three categories: Theological Foundation, History and Tradition and Spirituality: Saints and Blesseds. Students must complete six modules in each of the four categories making 24 modules in all. On completion of the five core modules in Theology, or in History, or in Spirituality, students write a long essay. When the three long essays are completed, one further long essay (in either of the three categories) is also required. In addition to the five core modules, one further module in each of the three sections is required. The remaining six modules may be chosen from any of the modules not already completed. 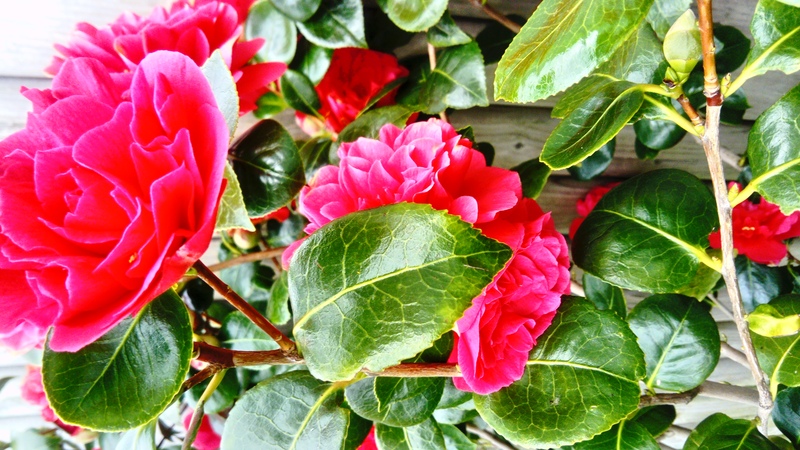 T10: Understanding the Charisms of Consecrared Life. T13: The Rebirth of the People of God: The Acts of the Apostles. T16: The Mystery of the Triune God: Father, Son and Holy Spirit. H01 Carmel: Development of the Tradition. H04 The Carmelite Charism: Exploring the Biblical Roots. H06 The Historical Founders of the Carmelites. H07 The History of Female Contemplative Life & Recent Developments . H09 The History of Carmelite Devotion. H10 Church History: Early and Medieval Period. H11: Church History: The Protestant Reformation and Modern Period. S02 St John of the Cross: Carmelite, Mystic, Poet. S03 Mary Magdalene de Pazzi. S06 Blessed Elizabeth of the Trinity. S08 Saints Louis and Zelle Martin. S09 Saint Albert of Jerusalem. S10 St Thérèse of the Child Jesus as Revealed in Her Letters. S11 St Teresa of Avila, Doctor of Prayer. S13: The Impact of God: Sounding from St John of the Cross. A module is delivered in the form of 16 units to be read and studied. The content of one unit is equivalent to approximately that delivered in a 45 minute lecture. Students will need to dedicate twice this amount of time to private reading beyond the material provided in the module. The Honours BTh (CS) course requires a total of 180 credits. Exemptions may be granted for up to three taught modules on equivalent modules completed elsewhere, subject to the approval of the Director of Studies. Students normally complete two modules per semester (4 modules per academic year), so that the course is complete in seven and half years (15 semesters). Students who want to study the course full-time can complete the course in a shorter time-frame. Students registered for the BTh (CS) and who choose to exit the course prior to the final award, and who have completed the requirements of either of the two Exit Awards, may request the CIBI Academic Board to be conferred with either a Certificate in Theology (Carmelite Studies) or a Diploma in Theology (Carmelite Studies). It is expected that students who achieve an overall second class honours grade in the BTh (CS) course, together with a mark of at least 65% in all four of the long essays, will be eligible to proceed to the MTh (CS). Students who receive at least 65% in two of the four long essays may be eligible to proceed to the MTh (CS) upon approval Academic Board. The Baccalaureate in Theology (Carmelite Studies) is accredited by St Patrick’s College, Maynooth. There were times when I found it a real struggle to find the time to engage with the assignments due to the, at times, heavy demands of full time job and supporting a young family. However, due to the way the distance learning course is structured, with very supportive tutors – flexible in their approach, I managed to complete the course. The course modules fulfilled both academic and formative expectations. I have found in them depth and substance, reflective of the scholarly effort of the module authors and tutors. I found the delivery of and the content of the modules to be very well structured and user-friendly. While awaiting the clock-work release of the module reading and questionnaires, my anticipation heightened with tackling each block of units and questionnaire. Should the Director of Studies permit a student to re-submit a failed assignment, a re-submission fee will apply. COURSE REGULATIONS 24th January 2016. The Baccalaureate in Theology (Carmelite Studies), or BTh (Carmelite Studies), BTh(CS) for short, is informed by the normative disciplines of Roman Catholic Theology and to provide the appropriate foundations for postgraduate studies in Carmelite Studies and, specifically, for CIBI’s Master of Theology (Carmelite Studies). The course is designed for three specific groups. Firstly, it is designed to offer BTh level qualification in the field of Carmelite Studies to those who might not be able to attend a full-time course due to their work commitments, vocation (enclosed Carmelite nuns, for example) or some other reason. Secondly, it is designed to allow the considerable number of students who have already completed the CIBI Diploma in Carmelite Studies to continue their academic engagement in the field of Carmelite Studies and to bring their studies to BTh level. Thirdly, it is designed to allow those who might not have a BTh-level qualification to acquire such a qualification in order to begin Masters-level studies in the specialised field of Carmelite Studies. The course makes the heritage of the Carmelite family available at Baccalaureate in Theology level across the English-speaking world using a part-time, internet-based mode of engagement/delivery. Responding to the significant numbers of Brothers, Nuns, Sisters and Lay Carmelites worldwide who want to deepen their engagement with, and academic understanding of, the Carmelite charism, it will provide a theologically literate approach to the history and tradition associated with that charism. Students will explore, discover and study the essential elements of a theological approach to the Christian life, and to the living of the Carmelite charism in particular. It will familiarise students with the basic outlines of the history of Carmel, its Saints and Blesseds, its tradition and its approach to prayer and Christian living. Having studied the material presented, having engaged with it and having presented their understanding for critical scrutiny and feedback, those who have successfully completed this course will be able to describe, present and, to some extent, critically engage with the principal elements of the Carmelite tradition. Although, students will not need to attend a particular campus and will normally continue with their previous commitments, the course will enable them to engage academically with the material in a manner that maintains the standards of practice typical of third level institutions, as well as qualifying them for higher-level studies such as the Carmelite Institute of Britain and Ireland’s Master of Theology (Carmelite Studies). Students will be required to engage seriously, and in an appropriately theological manner, with the history, tradition and spirituality of Carmel. Their studies will provide the background that will enable them to engage critically in the ongoing dialogue between the Carmelite tradition and the contemporary world and to participate in the formation or training of others interested in the field of Carmelite Studies. The BTh (Carmelite Studies) is a level 8, part-time honours degree course aimed at those who wish to broaden and deepen their knowledge of the Carmelite tradition. Applicants will normally have completed second-level education (equivalent to National University of Ireland Matriculation) but applicants 23 years of age or over on January 1st of the year of intended entry who do not fulfil the normal matriculation requirements may apply for matriculation on the basis of mature years. All CIBI courses are delivered in the form of a phased delivery of reading material made available through the CIBI website (www.cibi.ie) and all communication between the CIBI office and students is normally electronic and copies of all such communication are maintained in the CIBI office. The BTh (Carmelite Studies) is a part-time, undergraduate, honours-level (level 8) course leading to the specialised award of Bachelor in Theology (Carmelite Studies). 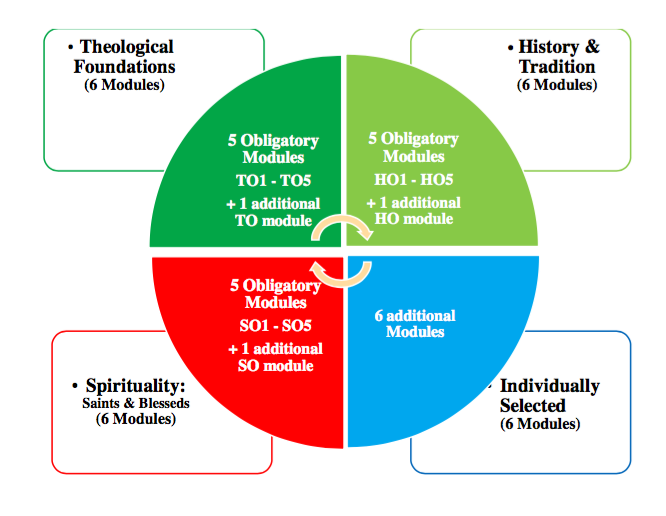 To complete the course, students must normally complete assessment of 24 of the available taught modules, which are divided into three categories: (1) Theological Foundations, (2) History and the Tradition and (3) Saints and Themes. Students must complete at least six of the modules in each section, including the five obligatory modules in section 1 (T01, T02, T03, T04, T05), section 2 (H01, H02, H03, H04, H05) and section 3 (S01, S02, S03, S04 and S05). The must also write four long essays of between 6,000 and 7,500 words, at least one relating to the section 1 modules, at least one relating to the section 2 modules and at least one relating to the section 3 modules. In each case, having completed the orientation module for the long essays, students will choose one of the three proposed titles in relation to these three groups of modules for their long essay. In order to complete the course, the necessary taught modules, and the long essays, must be completed within fifteen years of registration unless special dispensation has been given, and students who do not complete the course within the time allowed will only be allowed to complete the course when the Academic Board has been satisfied that there were good reasons why the course was not completed in the time allowed. Those students who have completed 12 taught modules (equivalent to 60 credits), including three of the theology modules, as well as one of the long essays, and who wish to withdraw from the course may request that they be conferred with the Certificate in Spirituality (Carmelite Studies) if they leave the course at that point. In order to complete the Certificate course, the necessary modules must be completed within eight years of registration, unless special dispensation has been given, and students who do not complete the course within the time allowed will only be allowed to complete the course when the Academic Board has been satisfied that there were good reasons why the course was not completed in the time allowed. Students who successfully complete 18 taught modules (equivalent to 90 credits), including at least three of the specifically theological modules, and two of the four longer essays (equivalent to 30 credits) may request that they be conferred with the Diploma in Spirituality (Carmelite Studies) if they leave the course at that point. The proposed Diploma in Carmelite Studies will require a total of 120 credits. In order to complete the Diploma course, the necessary modules must be completed within twelve years of registration, unless special dispensation has been given, and students who do not complete the course within the time allowed will only be allowed to complete the course when the Academic Board has been satisfied that there were good reasons why the course was not completed in the time allowed. Each taught module is assessed by four, ten-question questionnaires and a final written assessment on an assigned topic of between 2,000 and 2,500 words. Both the answers to the questionnaires and the final written assessment are submitted by email and all correspondence is conducted via the Institute’s office in Dublin. In each module, each of the four questionnaires is awarded 10% of the overall marks, the other 60% being awarded for the final essay. 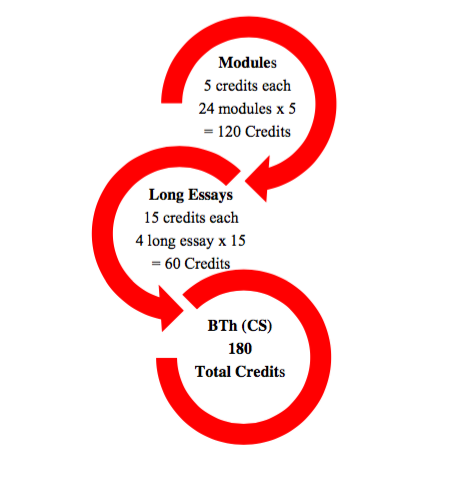 Five credits are awarded for each taught module (up to a maximum of 24) and 15 credits are awarded for each of the four long essays. Exemptions may be granted for up to three taught modules if the candidate can demonstrate to the satisfaction of the CIBI Director of Studies that equivalent modules have been successfully completed elsewhere. Five credits are awarded for each exempted module. The Baccalaureate in Theology (Carmelite Studies) requires a total of 180 credits. 120 credits are awarded for the 24 taught modules, each of which is a 5 credit module, and 60 credits are awarded for the four long essays, each of which is awarded 15 credits. The course will include six specifically theological modules (presented in such a way as to highlight the significance of those modules in relation to Carmelite Studies). 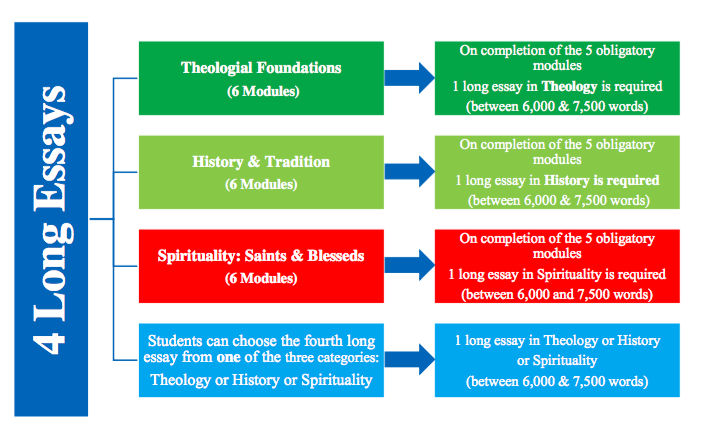 Each of the 24 taught modules, including the six theological modules, will include 16 units (each the equivalent of a lecture) and four assessed questionnaires with individual feedback (each being the equivalent of two lectures) as well as a final essay. Each of the taught modules shall be 5 credits (equivalent to a 24-lecture module). Students will also complete four longer essays, each assigned 15 credits. Those who achieve an overall second class honours grade in the BTh course, together with a mark of at least 65 in all four of the long essays, will be eligible to proceed to the MA in Carmelite Studies. Those who receive at least 65 in two of the four long essays may be deemed eligible to proceed to the MA in Carmelite Studies if the Academic Board so decides in their particular case. Students who successfully complete 12 taught modules (equivalent to 60 credits), including at least three each from the sections on Theology, History and Spirituality/Saints, and two of the four longer essays, may request that they be conferred with the Certificate in Theology (Carmelite Studies) if they leave the course at that point. The Certificate will require a total of 75 credits.In order to complete the Certificate course, the necessary modules must be completed within eight years of registration, unless special dispensation has been given, and students who do not complete the course within the time allowed will only qualify for the award of the Diploma in Theology when the Academic Board has been satisfied that there were good reasons why the course was not completed in the time allowed. Students who successfully complete 18 taught modules (equivalent to 90 credits), including at least four each from the sections on Theology, History and Spirituality/Saints, and two of the four longer essays (equivalent to 30 credits), may request that they be conferred with the Diploma in Theology (Carmelite Studies) if they leave the course at that point. The proposed Diploma in Theology (Carmelite Studies) will require a total of 120 credits. In order to complete the Diploma course, the necessary modules must be completed within twelve years of registration, unless special dispensation has been given, and students who do not complete the course within the time allowed will only qualify for the award of the Diploma in Theology when the Academic Board has been satisfied that there were good reasons why the course was not completed in the time allowed.